Zen is first of all a practice with the body. We sit on a cushion with crossed leg for more stability. Beginners put the feet on the ground. During many years we progressively switch to the quarter lotus, half lotus, full lotus. The pelvis is tilted forward, and that produces an erection of the vertebral column, all the way to the top. The posture of the hand is also important. During zazen, we concentrate on the posutre, the breathing and on letting the thought pass. With time, balance is achieved, and we can hold the posture effortlessly, while the breathing becomes deeper and deeper, with relaxation of the lower belly. 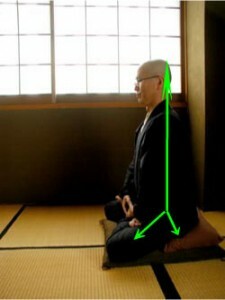 Zazen is simple. It is sometimes painfull, especially for beginners; but it will never hurt your body, if you take and leave the posture quietly, and not force. Zazen is also tough because we are not used to not-do something. Regular practice of zazen brings many benefits for the mental and physical health, however, the true practice of zazen is much beyond that level. It links you to the substance of your spirit, those who experience it, never stop.